When a customer moves into a new home or has to change the keys that operate his or her doors and the hardware is of good quality, he or she dos not have to purchase new hardware. The lock is recombinated (the combination of the lock is changed) by fitting new keys to the existing locks. A masterkey system is a system that is created so that each door or group of doors in a building has its own individual key (called a change key) and a masterkey that operates every door. A masterkey system can be multi-levelled meaning that there can be a grandmasterkey that opens all doors, sub-masters that open all doors in a related area, and individual change keys for each door (or room). An example of this is the grandmasterkey system we installed at a Hilton Hotel. There is a grandmasterkey, 12 sub-master keys (for example–front desk master, banquet master, engineering master, housekeeping master, accounting master, etc.) and individual change keys for each door or room. Safes and vaults opened by manipulation or drilling. 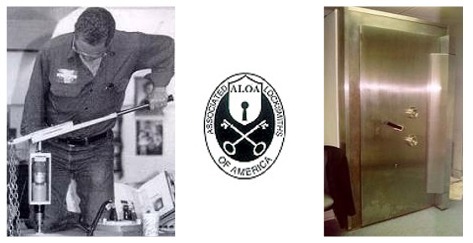 Opening of burglarized safes is a specialty. Service and opening of GSA vaults and containers is also available. Setting new numbers for the combination of safes. We are also current with the most recent building codes concerning Life Safety and Barrier Free Design for the Americans with Disabilities Act. We supply and install panic and fire exit devices, door closers and replace doors if necessary. Using key fobs or cards, we can set up a system that will allow the end user to track entry by date and time, set up time zones for automatic unlocking of doors, track attempts of unauthorized entry and many other features at an affordable price. If you want to "buzz people into your office", we can set that up. We can also install digital keypads for access. We do many different types of electronic locks for specialized applications. Bill's Lock, Safe & Security has a full service fabrication shop and office located in Linden NJ 07036. As a centrally located Linden locksmith and security professional, Bill provides a unique set of security skills to clients in New Jersey, New York City, Southern Connecticut and Eastern PA.